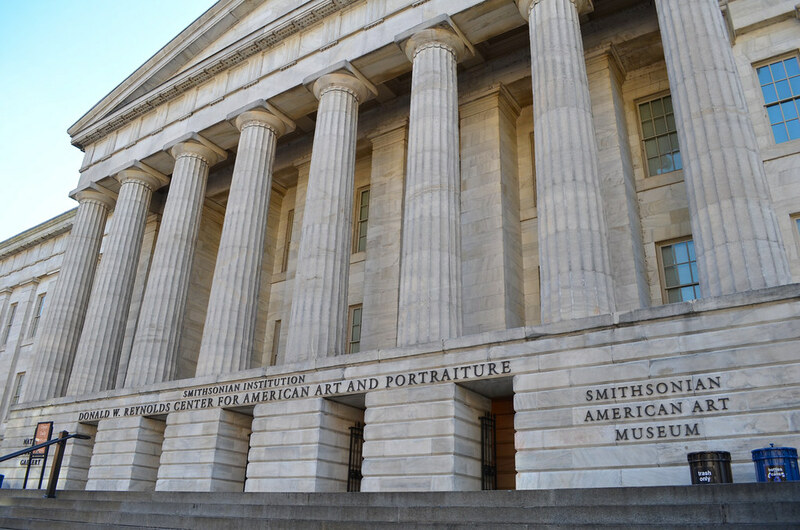 Holding the historic distinction of being the country's first collection of American art, the Smithsonian's American Art Museum remains a world leader for encapsulating the spirit of American culture through artistic creations. From Early America to modern day artists, the American Art Museum features paintings, sculptures, and more from every era of American artistry. American art reflects the country's melting pot philosophy with international influences making a unique and unparalleled style. The earliest pieces date back to 17th century Puerto Rico and follow the line of chronology through the Hudson River School, Folk art, collections from Latino and African American artists, and more culminating in the contemporary movements of today. See works by John Singleton Copley, Thomas Moran, Horace Pippin, Thomas Cole, and Georgia O’Keeffe among others in the permanent collections while revolving exhibitions feature topics in media art, American Masterworks, and direct carving figures. The Luce Foundation Center and offers a deeper and more concentrated look at the American spirit with thousands of pieces once part of personal collections while the Renwick Gallery showcases great works of art in the building that once held the original museum. Tours of the museum and the Renwick Gallery are offered for walk-ins daily while staff-led tours of the Luce Foundation Center and the Lunder Conservation Center are available weekly. The American Art Museum is open daily, except Christmas, from 11:30 am-7 pm. Renwick Gallery - Renwick is a branch of the Smithsonian American Art Museum dedicated to exhibiting the American contemporary craft. This gallery celebrates 'makers taking both innovative and time-honored approaches to work'. As the name may suggest, this National Historic Landmark was designed by James Renwick Jr, celebrated DC architect. Inside you will 'explore unique craft objects by contemporary artists to learn about the process, material, and technique' of each. See Between Worlds: The Art of Bill Traylor, the Grand Salon, and Nick Cave's Sound Suit during your visit, as well as the Museum Store. There are Collection Highlight Tours each Monday through Saturday at noon, as well as customizable group tours and school tours (for grades 1-12). The highlights include such categories as Early American Art, 19th Century, 20th Century, Contemporary, African American, Contemporary Craft and Decorative Arts, Folk and Self-Taught Art, Latino Art, Photography, Sculpture, Works on Paper, and Film and Media Arts.